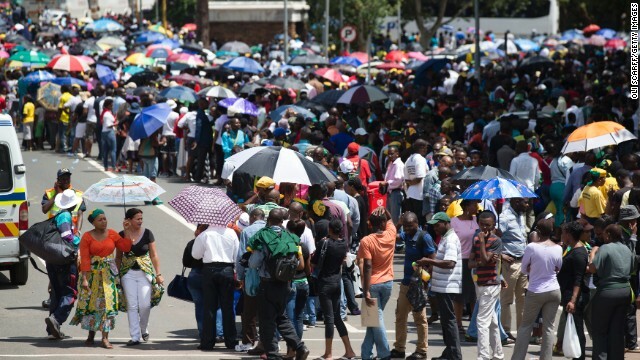 Crowds wait to say goodbye to Nelson Mandela as he lies in state in Pretoria for the last day. A Montana woman admits she shoved her husband down a cliff, Nelson Mandela lies in state for a final day, and North Korea executes the leader's uncle. Text but not call? : The federal communications agency made the call to allow cellphones during flights. But the Department of Transportation says hold on. The DOT does not want flights filled with yakking passengers, and says it's looking into the possibility of eliminating voice communications. Some say cell phone conversations are annoying in close confines of a plane, and have cast it as a consumer rights issue. The Federal Communications Commission voted 3-2 yesterday to consider lifting its ban. But Secretary of Transportation Anthony Foxx says his department will decide whether allowing calls is fair to consumers. Rene Marsh will be live with details all morning. Husband pushed off cliff: In a drastic twist, newlywed Jordan Linn Graham is admitting she shoved her husband down a cliff. Graham pleaded guilty to second-degree murder yesterday as part of a plea deal. She says she pushed her husband during an argument in July. "It was a reckless act," she says of the incident at Glacier National Park in Montana. "I just pushed." She was married to Cody Johnson for eight days. Kyung Lah will have the latest all morning. Goodbye to an icon: The former South African president lies in state in Pretoria for a final day today. Lines snaked around downtown as throngs waited to say their goodbyes. Mandela's last public viewing is at the same place he was inaugurated as the nation's first black president. His body will then be transported to his boyhood home of Qunu for the burial Sunday. Arwa Damon will have more details at 6. No. 2 executed: North Korea says it has executed the "traitor" uncle of leader Kim Jong Un. Jang Song Thaek was considered the second most powerful man in the secretive regime. State media described him as a "despicable human scum" and "worse than a dog. It accused him of betraying his party and leader. Jang was married to Kim's aunt and served as vice chairman of North Korea's top military body. He was often pictured beside his 30-year-old nephew. Jim Sciutto will be live with details all morning. House approves: No more government shutdown. Well, at least not for two more years. A compromise federal budget plan won easy approval yesterday in the House. It now goes to the Senate, where it is expected to pass next week. Its passage is a feat on its own. It represents a rare convergence between the two parties on government spending after two years of bitter debate. Their political brinkmanship included the 16-day shutdown in October. But military employees are not applauding the deal. It cuts their benefits. Athena Jones will break it down for us all morning. #blockrestored: Twitter makes a change that allows trolls to interact with those who’ve blocked them. Backlash ensues on –where else – Twitter. The social media giant listens. The block is restored. Social sabbatical: Speaking of social media, we knew this day would come. A Swedish company has designed a website that allows people to take a break from social media accounts. It sends an auto reply for your social media accounts to let people know you’re on a sabbatical. Taking another lap: For decades, these two brothers sat for a picture with Santa every year. Their evolution came full circle this year when their kids joined them on Santa’s lap. Unique escape: These over-the-top makeovers give cancer patients something to smile about, if only for a second. The popular program gives cancer patients makeovers with their eyes closed. The priceless moment comes when they open their eyes expecting glamorous looks. Instead, they are surprised with a hilarious new do. Mooooove! : Longboarder crashes into cows. And in the spirit of fun videos, join us this morning for our countdown! We all LOVE a good #viral video, right? We're counting down @YouTube's top 5 this am with their very own Kevin Allocca. Did you have a fave? Just yesterday you had an article on the home page about a US drone that struck a WEDDING PARTY and killed 15 people. Can one of CNN's professional "journalists" please explain how the quarrel between the FAA and DOT over cell phones on planes is more important for Americans to know than that their government murdered a group of innocents at a wedding? What a joke! Allowing calls on airplanes should be allowed. Passengers want to talk to their loved ones when traveling. When on the phone, passengers should respect others and keep their volume low. The newlywed couple was only married for eight days before they had an argument leading to the wife pushing him down a cliff. This is outrageous. They probably should not have gotten married in the first place if they only lasted eight days before getting in such a serious fight. Number three about Nelson Mandela's funeral is heartbreaking. The recent tweet and graphic do tie in with what I have learned in my online journalism class though. It is nice to see journalism properly represented. Numbers four and five also include recent tweets, graphics, videos, and photos.